South Korea’s national football team returned home Monday after suffering a quarterfinal exit at a premier continental tournament. The Taeguk Warriors were looking for their first continental crown in 59 years, but their title bid ended in disappointment after losing 1-0 to Qatar in the Asian Cup quarterfinal match on Friday. That was Bento’s first and only loss with South Korea since he took over the team in August 2018. South Korea passed the group stage with three straight wins over the Philippines, Kyrgyzstan and China. Bento’s side then beat Bahrain 2-1 in extra time to reach the last eight. Despite the result, the national team players received a warm welcome from more than a hundred fans at the airport, who gave presents and held signboards with their names. The players didn’t have smiles on their faces but appreciated the fans’ support. 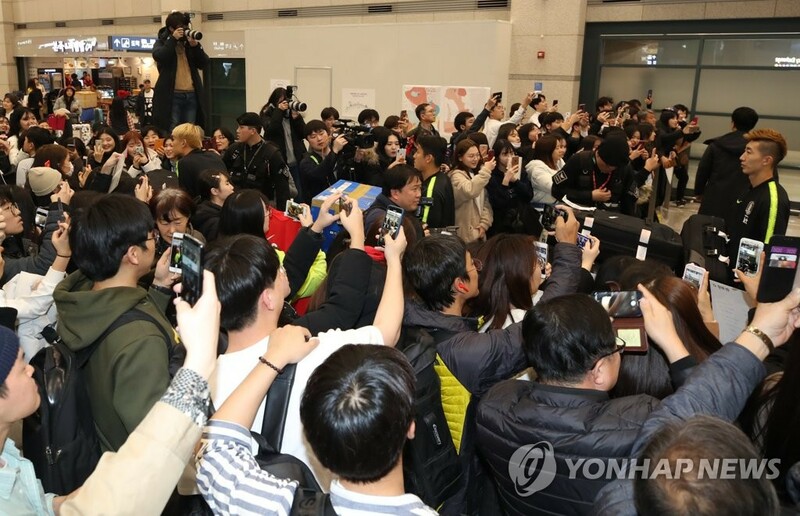 “I feel thankful to fans for showing up here at the airport even though we didn’t get the result that they wanted,” South Korean defender Kim Min-jae said. One of them is a friendly against Vietnam, which is led by South Korean head coach Park Hang-seo. The two sides will go head-to-head in Hanoi on March 26. The Korea Football Association (KFA) has yet to confirm the opponents for another March friendly match. South Korea will play two more friendly matches in June before they enter the second round of AFC matches for the 2022 FIFA World Cup qualification in September. A total of 40 teams will compete in the preliminary round of regional World Cup qualification after they were divided into eight groups of five teams. The eight group winners and the four best group runners-up will advance to the third round of World Cup Asian qualification and will also qualify for the 2023 AFC Asian Cup final tournament. For the future matches, Bento will try to solve problems raised at the 2019 Asian Cup. South Korea dominated ball possession but lacked precision and efficiency in attack, producing only six goals from 78 attempts.